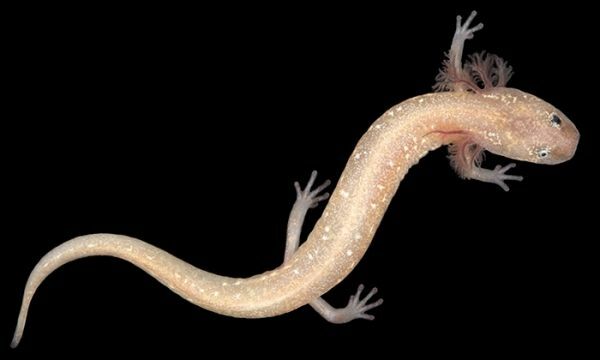 Biologists at The University of Texas at Austin have discovered three new species of groundwater salamander in Central Texas, including one living west of Austin that they say is critically endangered. They also determined that an already known salamander species near Georgetown is much more endangered than previously thought. The groundwater salamanders of Central Texas — just 2 to 3 inches long — swim in springs, underwater caves and channels deep within limestone rock and are keystone species in the local Edwards and Trinity aquifers. As top predators, they help maintain the health of aquifer ecosystems, meaning they are key for preserving water quality in the aquifers that local residents depend on for nearly all the fresh water supplying nearby cities, industries and agriculture. The loss of these salamanders would compromise the delicate aquifer systems of which they are a critical part, the biologists said. “Even if people do not care about salamanders, they care about maintaining the quality of the aquifer systems that provide most of Texas with its fresh water,” said David Hillis, professor of integrative biology and senior author of the paper.